It's easy to upcycle an old mailbox into a new birdhouse, and your backyard birds will thank you for providing a generous space for their nesting needs. There is no need for special woodworking skills or other techniques to create a mailbox birdhouse, but there are both simple and more advanced ways to turn a mailbox into a birdhouse or nesting platform. Any standard-sized mailbox can easily be turned into a birdhouse. While new mailboxes can be purchased from home improvement stores, used boxes can often be found a thrift stores, yard sales, or from neighbors who might be doing home or garden renovations. Curved-top mailboxes are the most common, but other shapes are also suitable. Even newspaper delivery tubes can become safe, comfortable birdhouses, and either metal or plastic boxes or tubes can be used. Some minor damage or warping is no problem for a birdhouse, and rust or discoloration won't bother the birds, making this an ideal project for recycling materials. In addition to the box itself, the only other tools needed for this project are a drill with a small bit, as well as a spade bit for creating the entrance to the house, and sandpaper for smoothing rough edges. It doesn't take much to turn a mailbox into a birdhouse, but the box should be thoroughly cleaned first. Any peeling paint or letters should be carefully removed so nestlings do not nibble on potentially toxic debris, and screws should be tightened so the house is snug and secure. Use the small drill bit to create several drainage holes in the base, as well as several ventilation holes along the long sides of the house. Position the ventilation holes halfway up the sides rather than on top of the house, because higher holes are more likely to leak, but do not position holes so low on the sides that they will become blocked when birds build a nest. To allow birds into the house, use the spade bit to drill an entrance hole in the mailbox door. Position the hole closer to the top of the door than the bottom so it will provide additional ventilation but nestlings will not be in danger of spilling out. No perch is necessary, and adding one would only give predators a convenient hold to access the house. Once the hole is drilled, use coarse sandpaper to smooth any sharp edges so birds are not injured as they enter and leave the house. For an easier house, opt for a nesting platform. Instead of drilling an entrance hole, simply open the door and allow it to stay open as a convenient ledge, or remove the door entirely. Birders who want a more elaborate house can first remove the mailbox door and use it as a template to create a wooden front door using a piece of scrap wood and a simple saw to cut the shape. Drill the entrance hole in the wooden panel, then wedge the panel into the front of the mailbox, pressing it back and inch or two to create an overhang to protect the opening. Use a piece of wood at least a half inch thick for greater stability, but do not worry if the shape is not perfect. The overhang will minimize any water intrusion, and any gaps will provide additional air circulation to keep nesting birds comfortable. After the front panel is in place, the mailbox door can be reattached as a ledge, or it can be discarded. Birds are not picky about the appearance of their house, but decorating the mailbox can make it a wonderful garden accent. While the inside of the house should be left bare so there are no toxins in reach of the birds, the exterior can be decorated in any way a birder desires. Vinyl or magnetic mailbox covers create easy decorations, or the box can be painted or decorated with moss, twigs, pebbles, or other items. The box might still have the house numbers incorporated into the décor, or adding bird names (as if they were the homeowners) can make it an even more quaint design. A mailbox birdhouse can easily be mounted to a post, just as if the box were still in use for postal delivery. 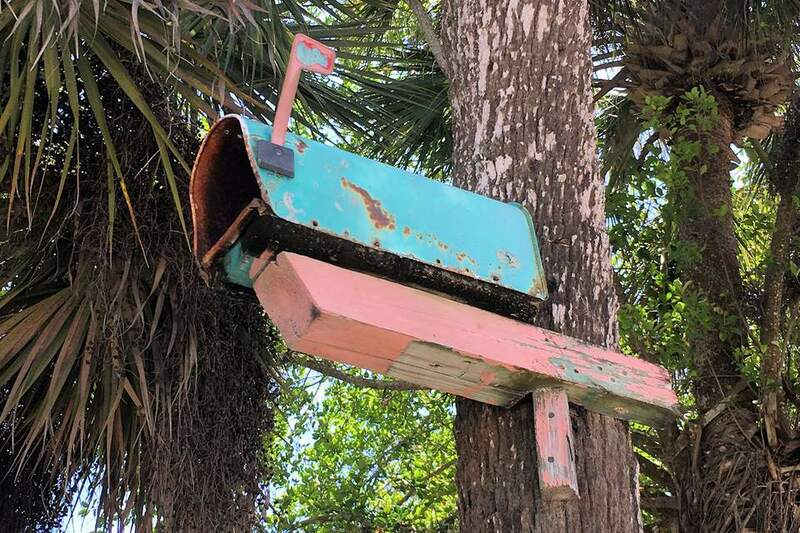 The post should be moved away from your home's real mailbox, however, so there is no confusion about where birds should nest or where mail should be delivered. Positioning the house in sheltered, shady spot will make it even more attractive to birds. The mailbox can also be mounted on a deck or fence railing, or use several screws through the back of the mailbox to mount it to a tree. Ideally, a branch or wood beam should be positioned under the mailbox to give it additional support. Mailbox houses can be hung, but it will be necessary to drill small holes at the front and back of the roof to attach chain, twine, or cord for hanging. If the house will be hung, position it in a sheltered area where there is less wind, as many birds will not nest in a house that swings or sways. Every birdhouse should be cleaned regularly to minimize bacteria or insects that could harm nesting birds. A mailbox house is easy to clean because of its wide entry; simply open the door or remove the wooden front panel, remove any nesting material or old nest, then use a rag dampened with a weak bleach solution to wipe the interior. Check that the ventilation and drainage holes are clear, then leave the house open to thoroughly dry before reassembling and mounting it for the next interested family to use. Upcycled projects add charm to any birder's yard, and a mailbox birdhouse is an easy option for providing nesting space to backyard birds while recycling old materials. Before you know it, birds will be making special deliveries in their new residence.